"I wanted to serve a different dish from the usual seafood casserole so I played with the dish and came up with this." Melt butter with olive oil in a large pot over medium-low heat; stir in onion and sauté until translucent, about 5 minutes. Whisk flour into butter mixture; whisk in half-and-half and juice from drained clams. Stir Parmigiano-Reggiano cheese into onion mixture until melted, about 2 minutes; stir in potatoes, cream-style corn, corn kernels, and cherry tomatoes. If soup is very thick, stir in water, about 1/2 cup at a time, as desired; bring soup to a simmer and cook until potatoes are tender, about 15 minutes. Season with sea salt and pepper. Stir drained clams, haddock, and shrimp into soup; simmer until haddock and shrimp are fully cooked for 5 minutes. Stir in lobster and its juice; cook just until heated through. 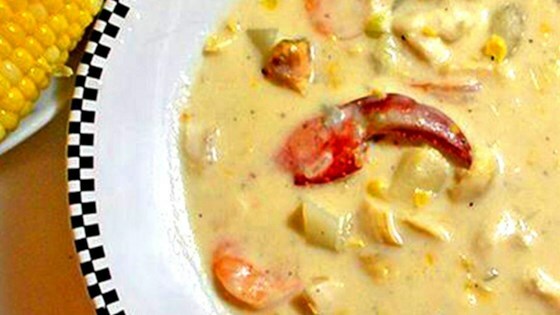 See how to make a low-fat chowder that’s creamy and full of flavor. Add enough water to thin chowder if needed. Bar clams and lobster can be purchased in bottles. OMG the best clam/corn chowder that I've made so far! I replaced the cherry tomatoes with celery instead.